Are you sick of applying nail colour every second day? The revolutionary Calgel nail colours are here to make your life simpler. Calgel nail paints or the long lasting nail paints stay for about 6 weeks on your hands and even longer on your toes. 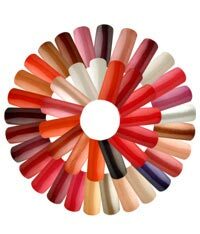 Calgel is a gel based semi-permanent nail colour which is available in 70 different colours at Seka's Beauty Case @101 Darley Beauty Collective in the Northern Beaches. Calgel nail paints can be applied over natural nails or nail extensions, they are completely safe, and do not harm your nails in any way. Calgel nail paints are easy to apply and free from chemicals, and are not tested on animals. The application of Calgel nail colours is easy and you do not have to visit salons across the Northern Beaches every time you need to get the nails painted. Calcrystal can be used to touch-up on the new nail growth conveniently at home. Similar to the application, removal of Calgel nail colour is also very easy. You can remove your colour using calcleanse, a remover for Calgel nail paints. Calgel nail colours have become very famous because of the gas-permeable gel layers. This allows for moisturizer to pass through them which leaves your natural nails healthy. Seka's Beauty Case @101 Darley Beauty Collective in the Northern Beaches is proud to offer such a simple solution like Calgel nails to people in Sydney. We promote and recommend Calgel nails to our clients due to the advantages associated with them. We understand that our clients are very busy and may not find time to change nail colour often. 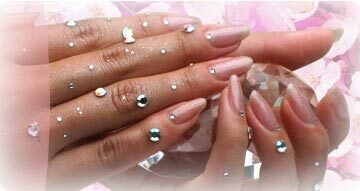 To make their lives simpler with beautiful nails we offer Calgel nail solution to our esteemed clients. At Seka's Beauty Case @101 Darley Beauty Collective on Sydney’s Northern Beaches we believe Calgel is a superior gel nail system that promotes nail health. Calgel won’t lift, peel, chip, go rubbery or damage your own nails with harsh acrylics or drills. Calgel doesn’t interfere with nailbed metabolism which is why it can actually strengthen your own nails giving you the nails you always dreamed about. Calgel can be used on tips or as a natural nail overlay, and is available in over 80 colors, so the days of smudging, chipping and peeling nail polish are over! Calgel requires minimal buffing of the nail plate prior to applying gel coating or gel sculpture treatment and no primers are used either. Your natural nails will not suffer damages from filing and application of harsh chemical solutions. Calgel does not contain acrylic or other monomers, and has no offensive smell that is characteristic of conventional nail products. Used on its own, it does not damage the natural nail. Not only the gel but also other products such as solutions that are used with the gel are hypoallergenic and less damaging to the nail. Additionally, Calgel has a wide range of products that provide additional nourishment while you wear the gel on your nails. Calgel guarantees superior adhesion to the natural nail and a long-lasting finish. The gel layer is gas-permeable, so it allows moisture to pass through. Since moisture is not trapped between the gel layer and the natural nail, there is less chance of the application pealing off. With fewer visits required to the nail salon for touch ups and other treatments (on average, every 3 to 4 weeks), it is far more economical for the customer. The most outstanding difference between Calgel and other nail systems is the flexibility of the nail after application, which prevents breaking or chipping. The coating is thin and natural looking, quite indistinguishable from your own nails. Calgel can be removed safely and easily with a solution called Calaway. In contrast to systems that remove the product by filing down, this solution is formulated so that you can simply take off the gel, even on your own. The gel layer lifts off with ease, minimizing damage to your natural nail. In addition to the clear gel, Calgel offers 70 different colors (Color Calgel) to choose from. There is no need to wait for French nails and nails colored with polishes to dry, and no worries about making a mess either. Clients can use Calcleanse (remover formulated for Calgel nail polish) and Calcrystal (top coat) to apply touch-ups on new growth and maintain their own nails at the convenience of their home. Applying the clear gel over nail arts such as hand painted designs and rhinestones will keep the nails in pristine condition for an extended period of time. Using this flexible and durable clear gel for 3D art is also very popular. Calgel is only used by qualified nail technicians who have completed the training program supervised jointly by the manufacturers of Calgel and Calgel Japan. Calgel has long enjoyed the support of nail professionals and clients alike because of its dedication to quality through the educational program, offered since the compnay’s founding. 1. Gel nails refer to the system of nail enhancement (designing, extension and coloring) through the application and curing of the gel on the nail plate. 2. Hard gels refer to those that maintain hardness like glass after application and are highly resistant to solutions. 3. Soft gels are flexible after application and have lower resistance to solutions. 4. Mix the synthetic resin, pigment and glitters well as the components may separate or settle to the bottom of the jar. 5. The Clear Calgel with high transparency usually cures in approximately 60 seconds. With higher pigment content, the gel takes longer to cure. What is the curing process? 3. Once the curing is completed and the resin is hardened, the gel adheres firmly to the nail plate. 4. Curing may be incomplete or poor when the gel layer is too thin and lacking in photo-initiators. 5. 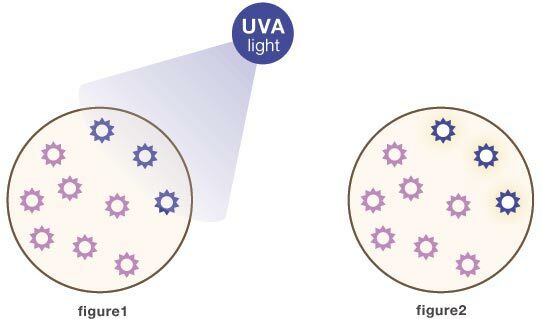 Curing may also be incomplete or poor when the layer of Color Calgel is too thick and the UV light cannot penetrate areas blocked by the pigment content. Polymerization refers to the chemical reaction by which monomers (single-unit molecules) bond to form a longer chain called polymers. A molecule is gaseous or in liquid state without the chemical bond, but becomes a solid and is stabilized once the chemical bonding is complete.